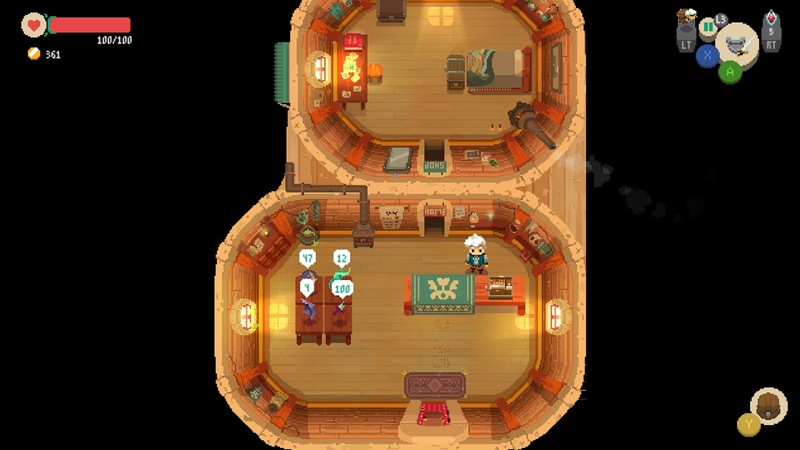 Collecting Asylum: Asylum Reviews; Moonlighter [Xbox One]. The basic premise of Moonlighter is fairly straightforward. 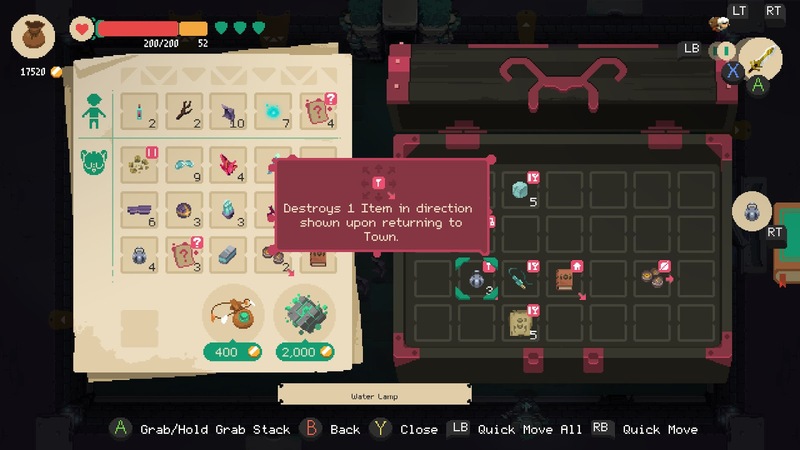 You work your way through dungeons, killing monsters and gaining loot. This loot is then either sold through your shop, or used to upgrade your stuff. The pixel-art style immediately appealed to us, as well as the rogue-lite gameplay. Everything is colourful, and a joy to look at. 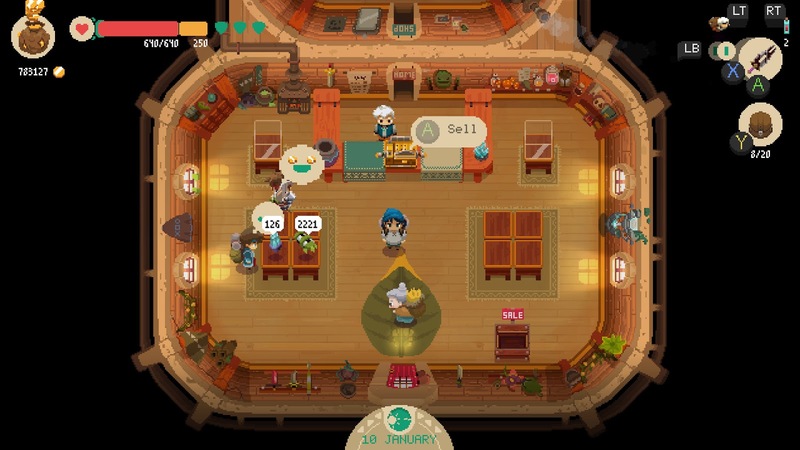 You play as Will, an "adventurous shopkeeper" who runs his own business in the small village of Rynoka. Five ancient gates that were discovered nearby each lead to different worlds. You must interact with the villagers to determine what stuff they'd like to buy, so that you know what to hunt for in these realms, to stock your shop. 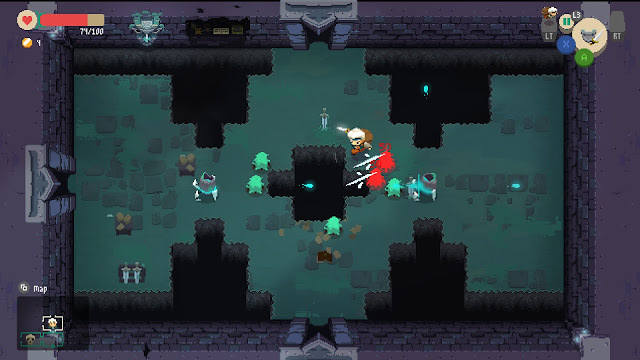 These five "dungeons" (with three levels each) must be completed in a set order, so you might be worried that you'll blast through all of Moonlighter pretty quickly, but no, its rogue-lite play style means that each time you enter a gate, the layout and enemies are completely randomised, giving you tonnes of replayability as well as unlimited access to potentially new, rare items to sell to the villagers of Rynoka, or use to craft new items and equipment. Making your way through these dungeons can be quite a challenge: the combat isn't the smoothest. You have only two types of moves, as well as the ability to dodge and whilst the animation of an attack is still in play, you are unable to change direction quickly which can often leave you open for attack. Movement, at least on Xbox, is tied to the left analog stick, and attacking with the A button. We both felt that utilising the style of twin-stick shooters would have vastly improved the combat. Entering the final gate, which is locked by four keys (hidden behind each of the other gates) is Will's ultimate goal to becoming a hero. Will's grandfather hopes that restoring your late father's shop will breathe life back into it, and the village, so searching for all of the finest loot helps serve his goal too. Keeping your shop stocked, and frantically running back and forth to adjust item prices to keep customers happy was surprisingly quite an enjoyable experience. It gave far more weight to the shopkeep side of things, instead of focusing mainly on the dungeon crawling. As you bring more customers to the area, it will begin to thrive. New businesses will open and the village of Rynoka will start to boom. Customers will flock in the moment you open your shop each day, before perusing your stock and alerting you to their opinions on stock and pricing. You are able to upgrade your store to be able to hold more items for sale, encourage people to buy, etc. Enemies are not too varied, and feel very similar to each other, aside from a different colour. The bosses on the other hand are well designed, with far more variety and clear amount of time spent on their appearance. The score is very fitting for the game, with nostalgic, calming tunes. It's reminiscent of early Nintendo games, and I really loved the way the music tied in. As well as the wide variety of loot you can collect whilst making your way through the dungeons, you may also come across cursed items. These items will show a small arrow, pointing in the direction of which item will be affected, meaning that some careful consideration is required when placing items in your bag. Another thing we really liked was the ability to bring in employees to your shop, allowing them to manage the shop on your behalf. You can also accept quests from NPCs for items that they are looking for, in order to specifically track down particular loot when taking on enemies behind each gate. Items gained from enemies, such as cores from the Golems can be sold at your shop for a high price, but not permanently. The customers are smart, and will quickly lose interest in certain items if they have no use/serve no purpose for them, so deciding when to call it quits from a dungeon based on the loot you've gained so far can be a guessing game sometimes. This was teetering on the edge of being a Gie it a Go! rating, however it just clinched that higher rating, and at just £16.74 on the Xbox Store, there's no excuse not to try it out. 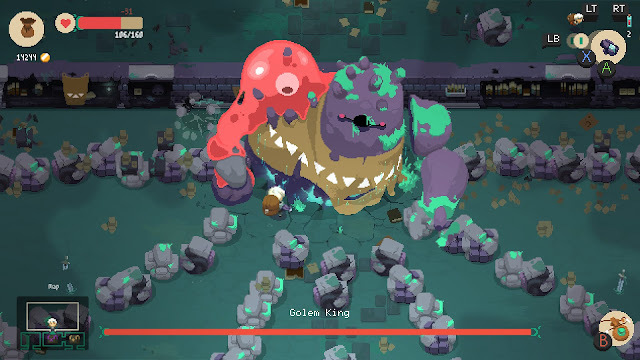 Have you played Moonlighter? What did you think of it?